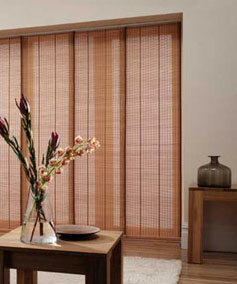 Panel blinds are manufactured from broad fabric or woven wood panels which stack neatly behind each other when the blind is open. When closed a complete attractive screen results offering excellent presentation with contemporary style. Effective both as a window blind or room divider. A panel blind is particularly well suited to cover larger areas of glass or divide a space up in to smaller spaces by acting as a room divider. The panels bunch to either side or can be bunched evenly to either side. The panels can be operated by either a wand or a corded system.